While the S&P looks flat, hovering along the 1065 level, the S&P futures look spiky, making relatively huge moves in the past week. See chart from SlopeofHope. I hope Yasi is doing ok trading the e-mini. This is a warning shot of a change of trend. The wave count is right on the cusp. Remarkably it has bounced along the 62% retracement at Sp1065 for two days. Yesterday I discount due to light trading (Jewish holiday) but today the volume came back and the market faded after a morning blip up (presumably from overnight orders being filled). The 1061 pivot was but a momentary obstacle. One shouldn’t make too much of Fib retracement levels, but typically a wave 2 will go back no more than 62% (with at times a slight slop-over above). Prechter kept finding 78% retracements of wave 2s back in 2001-2 in his favorite formation, a nested 1-2; but in retrospect the period can be better counted without those unusual wave 2s. And so to here. Although a wave 2 could theoretically retrace 99%, they rarely do, and a break above 62% usually indicates the count is wrong. Hence it is fascinating to see how the 62% level provided resistance other than the morning slop-over to 1069. Right now we have two counts to watch, and both involve that pesky 62% level slop-over at sp1069/Dow9835. 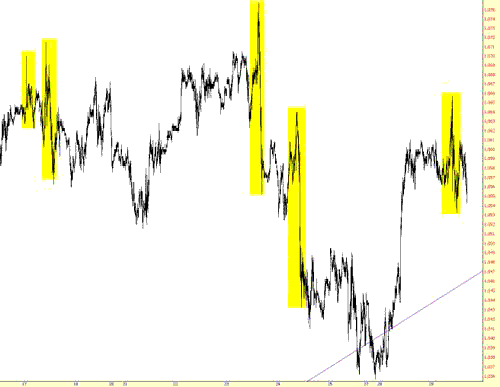 I showed several wave structures on Friday, and the bullish one is still extant (the first chart here). Bullish count has us ending wave iv down off Sp1080 at Sp1041. The rise off that breaks as a five-wave impulse to SP1069, and the long goodbye at Sp1065 is a corrective minor wave ii. Expect a rip-roarin’ wave iii tomorrow to break Sp1069 and run past the recent high at 1080. Sp1100 in sight! And Dow10K! Likely timing is Oct8-15 for this to peter out. It would match a pattern of month-end/month-start strength, although one should not rely too much on such patterns; the prior quarter end was a downturn into Jul8. Bearish count has us ending the first wave down off Sp1080 in between the two charts from Friday. The up and down to a lower low at Sp1041 on Friday counts as waves A and B of a flat correction, and the fast charge up Monday/Tuesday-at-the-open to Sp1069 is wave C. A flat breaks as a 3-3-5, and waves B often go beyond the start of wave A, so this fits even though (read Daneric’s post today) the waves A and B are relatively tiny. Expect a rip roarin’ drop in a wave iii down. If we break 1070, the bull is on. If fail to break it tomorrow, the rout should be on. Other warning signs are ambiguous. The USD has rallied, and given the inverse Dow/Dollar relationship, is bearish for stocks. But the rally is not yet convincing. If we pop up tomorrow the USD is likely to fade and retest DX74.50. Gold counts as a five-wave down off the recent peak, which indicates a change of trend to down. Volume increased a lot today but breadth was mixed. The most interesting warning sign is the second chart from InvestorsIntelligence which comes courtesy of the STU today. 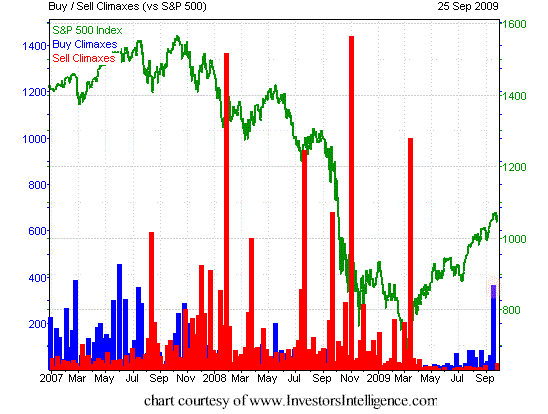 It shows a spiky series of buying climaxes – new 52 week highs followed by a lower weekly close.